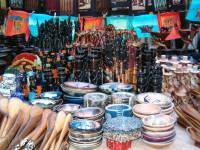 Greenmarket Square in central Cape Town is well known for it's market of African art, woodcarvings, jewellery, clothing and curios. The market is a popular location for tourists to stroll down the cobbled streets and bargain with the traders for just about any African memento one can think of. Bring your wallet, your bargaining brain and enjoy the bohemian surroundings.